Here are some of my favorite tips and tricks of the moment that are helping to keep me sane and my toddler engaged. Happy parenting! Toddler Tip #1 - Finger paint doubles as bath paint! If you already have finger paint around the house there is no need to buy the "specialized" bath paint. We use finger paint on our tub almost every night and it washes off like a charm...actually, better than the bath paint! While you're at it, you can work on mixing colors to make new ones. Everett loves this and is pretty good at recognizing that red and blue make purple, yellow and red make orange and blue and yellow make green. We put the two colors on the wall with space in the middle and he mixes them himself. Remember, doing is learning. Instead of just showing your kiddo, let them explore with their own hands! Toddler Tip #2 - Magnetic letters and numbers can be posted on the side of a mirror for quick quizzing. I don't make a huge deal about quizzing him on his letters and numbers every night, but sometimes while he's in the bathtub I will just say, you get 5 extra minutes if you can tell me this column...works like a charm. Then I switch them around and do it again. He thinks it's a game and I love that he's getting a little more enrichment before he hits the sack. Toddler Tip #3 - Tear a page out of your favorite book and frame it for easy, kid friendly artwork. One very inexpensive and easy way to add interest to your toddler's room is to pick out a few pages from some of your favorite books (maybe the ones that have pages falling out already) and frame them. I have a few duplicates and love the way this kid-friendly artwork turned out. I already had the frame, so this was a zero dollar project...even better! To make the page pop, I painted the matting and used a piece of patterned scrapbook paper for the background. Toddler Tip #4: Freeze marshmallows for a quick and not so hard ice pack. These cuties don't free quite as hard as ice and mold better to the "ouchie". They also make for a great snack when your little one stops crying and starts to feel better! Put in individual bags for easy access. Toddler Tip #5: Small puzzles are great to keep your littles busy when waiting for food at a restaurant. I have to admit, I don't hate iPads for toddlers - mine loves watching videos as much as the next little one, but one of my BIGGEST pet peeves is seeing a family out at a restaurant for dinner and every single kid has a screen in front of his/her face. Communicating with each other is a lost art and I think it's important to find other ways to keep a little one busy and engaged without being zoned out and entranced in a video. Enter my love for mini jigsaw puzzles. Puzzles, in general, are great for spatial awareness and problem solving. We do them a lot at home but usually, the "kiddie" puzzles are over sized and come in huge boxes. 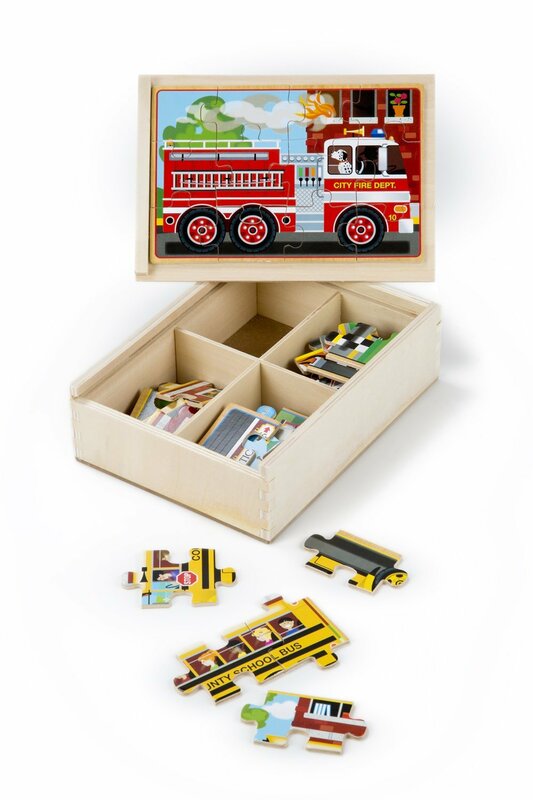 When I saw this mini version from Melissa and Doug I was so impressed. 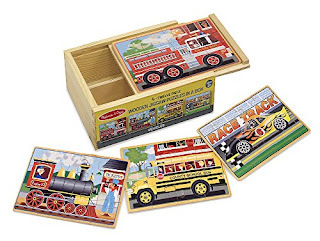 The box contains four 12 piece wooden jigsaw puzzles that are very age appropriate and great for travel. 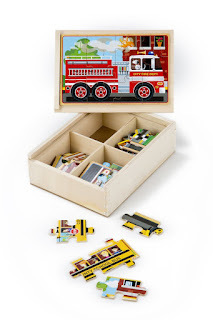 The top of the box becomes the building platform and the puzzle pieces are stored inside in 4 separate quadrants (each of the puzzle pieces are labeled with different shapes on the back for easy sorting). This is a great way to keep your kiddo occupied and engaged the next time you are out and about.